Join Vivian Campbell and other special rockers for a charity concert presented by Rockers Collective – A fantastic get-away in sunny California where you’ll enjoy a unique dinner party with the lead guitarist of Def Leppard, who has been inducted into the Rock & Roll Hall of Fame, followed by a phenomenal rock concert. For only $250, you’ll have the opportunity to enjoy a three-course meal with Viv, have photos taken, etc. 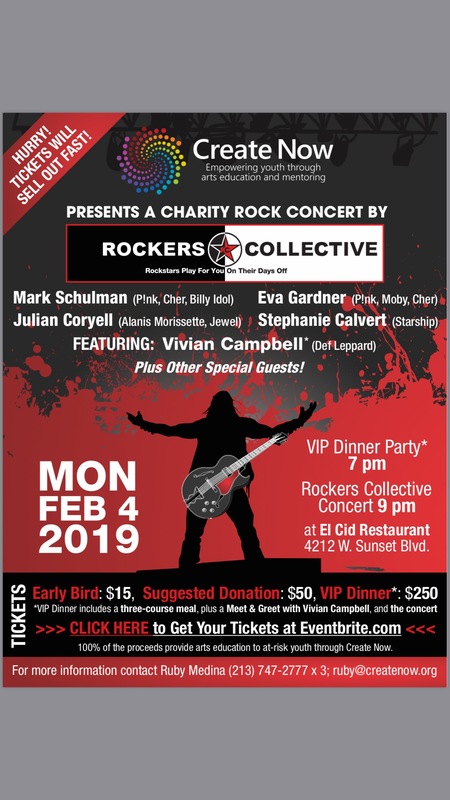 The dinner will be followed by a phenomenal concert with members of Rockers Collective, which includes Mark Schulman and Eva Gardner of P!nk, plus other world-class musicians. 100% of the proceeds from this event will be donated to Create Now so we can implement more arts programs for the most vulnerable kids in Southern California.